Atlantic salmon farming has traditionally been dominated by a small number of farming regions – Chile, Norway, Canada, and Scotland – as several natural conditions often have to be present to ensure optimal salmon farming production. Such conditions include: cold water temperatures varying between 8°C and 14°C (46°F – 57°F), a sheltered coastline, and optimal biological conditions. Today, salmon farming is also taking place in Australia, Faroe Islands, Iceland, Ireland, and New Zealand. The salmon farming production cycle lasts about 3 years. The first year of production takes place in controlled freshwater environments, and then the farmed salmon are transported to seawater cages. 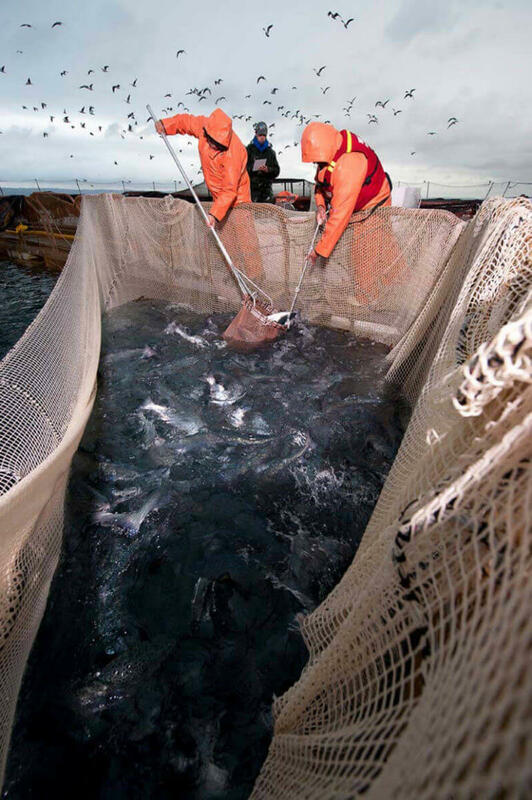 Once the farmed salmon reach a harvestable size, they are transported to processing plants to be prepared for sale. For consumers, most farmed salmon is sold as salmon fillets, although you can also purchase whole fish. The FAO of the UN predicts that the world’s population will reach 9.7 billion by 2050, with the need for protein expected to grow by 40% worldwide. The UN, however, estimates actual demand to double. [i] Fish, particularly farmed salmon, can offer one solution to meeting this increased demand. As demand increases there will no doubt be increased pressure on the already over-exploited wild fish reserves, which is why farmed fish is required to efficiently manage and maintain both wild fish stocks and the ocean’s natural biodiversity. It is important that the farmed salmon industry ensures sustainability is at the core of their operations if they are to meet this demand in a sustainable manner. 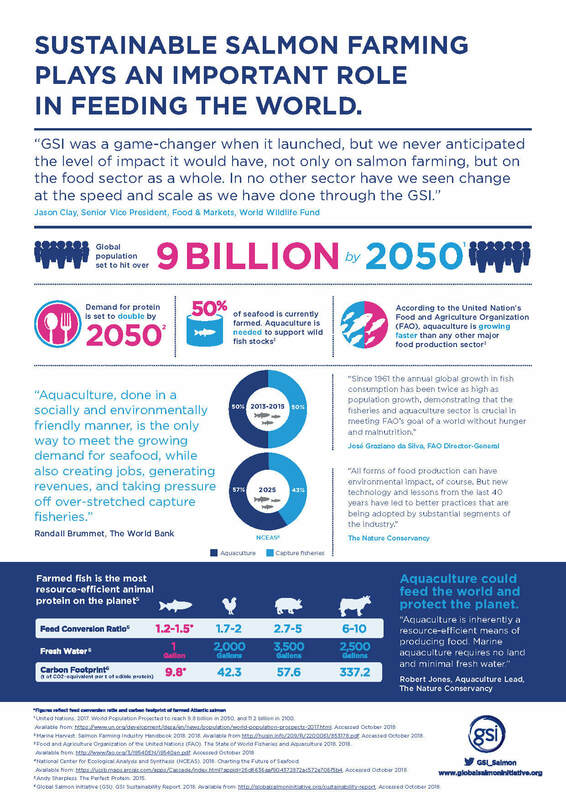 Farmed salmon is also a highly efficient source of protein production, and continues to outperform other protein sectors (chicken, beef, pork) when it comes to key data such as feed conversion ratios, protein retention and carbon footprint – see the GSI Sustainability Report for more detail. With this in mind, it is clear that the farmed salmon industry can make a key contribution to balancing the needs of feeding the growing global population, as well as meeting the demand for healthy and sustainable protein production. When we visualize the future of food, we need to ask three key questions: how can we make enough, is it healthy, and is it sustainable? As demand for protein continues to increase, so will production – we therefore need to be vigilant in assessing the environmental footprint of what we are eating and ensure responsible social practices. Aquaculture is one of the most eco-efficient ways of producing protein, and salmon farming is leading the way in aquaculture innovation – offering one possible solution to the global mission to meet growing protein needs, while continuing to support healthy and vibrant oceans. For more information please visit the Pathways to the Future blog page.